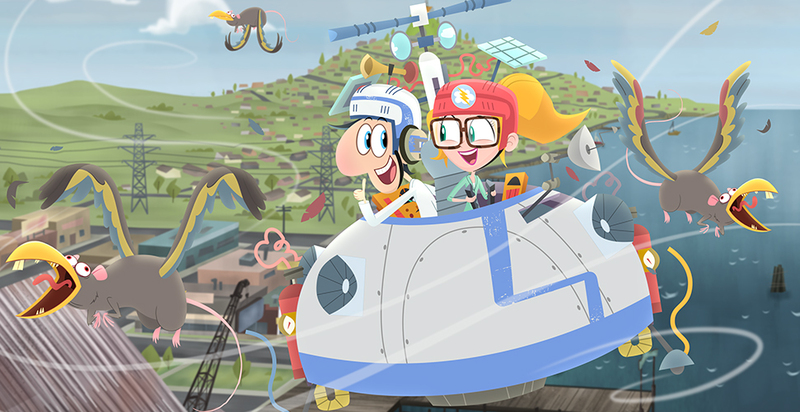 Cloudy with a Chance of Meatballs: The Series takes place before giant food rains down on Swallow Falls, when sardines are still the driving force behind the blue-collar town’s booming economy. Flint Lockwood is a high school student who suffers from NFD: non-fish-related dreams. He strives to be a serious inventor in a world beyond sardines…and maybe one day have his inventions change the world instead of blowing up in his face. Joining the cause is Sam Sparks—new girl in town and aspiring meteorologist. Flint and Sam come together for comedic adventures with all the great characters from the film: Flint’s dad, Tim; Flint’s lab assistant, Steve the monkey; Earl, the school’s busiest teacher; Manny, the head of the school’s audiovisual department; Brent, the local teenage celebrity and captain of the mascot team; and Mayor Shelbourne, who wins every election with a pro-sardine platform (and bribes…lots of bribes).